Manhattan Neighborhood Network (MNN) is a 28-year-old non-profit community media center, offering a wide array of media production, education, and distribution services for Manhattan residents and community organizations. Our vision is to empower local voices and diverse views. MNN offers affordable training in video production, editing and broadcasting to Manhattan residents who wish to become Certified Producers with MNN. MNN also produces the cable and digital channel NYXT.nyc (pronounced next dot n.y.c.). Presented in partnership with more than 60 Manhattan community-based organizations, NYXT.nyc shines a spotlight on groups that are working to connect people and build neighborhoods. NYXT.nyc is available on Spectrum 1992, FiOS 38, and online at nyxt.nyc. In addition, MNN offers MNN-FSTV, a partnership with independent media network Free Speech TV. MNN FSTV is available on Spectrum 1301 and FiOS 39. Click here to read MNN's 2016 Annual Report. In 2007, MNN committed to expand its community media services and identified the East 104th Street Firehouse as a potential site for this purpose. After conducting an extensive architectural, engineering and environmental assessment of the Firehouse, MNN decided to purchase it. The historic building constructed in 1883 achieved landmark status, and MNN began a total renovation. The MNN El Barrio Firehouse houses three television studios, editing suites and classroom spaces in the four-story building. The lobby includes a gallery space showcasing the work of visual artists, photographers and artisans. A three-camera television studio on the first floor is the site of community events, activities and television productions. The Producers’ Hub on the second floor is the center of the public access facility with two fully equipped express television studios, several editing suites and classroom. The Youth Media Center on the third floor is dedicated to workshops, classes and training for young people. The Firehouse has an interesting history dating back to the 1800s. Designed by Napoleon Le Brun & Sons, the official New York City Fire Department architects, the Fire Department purchased the lot on 104th Street for $5,500 in May 1883, and Engine 53 moved into the brand new building on January 15, 1885. The basement was used for coal storage and a workshop. The street level floor was roughed in squares to give the horses traction. The hose tower, which looks from the front as if it were another full floor at the top of the building, had a water tank for spare supply, hay and grain storage for the horses. In February, 1893, the building had hot water and an indoor toilet added. Horses were used as late as 1922, and at about that time a cement floors was poured at street level to accommodate the "horseless" carriages and pumpers. 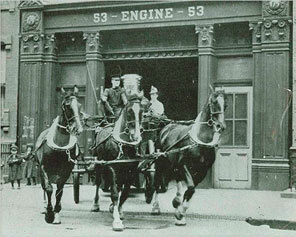 In 1972, Engine 53 moved to Third Avenue and 102nd Street. A year later, El Museo del Barrio began renting the building making gradual improvements and purchased it at public auction from the City of New York in May 1980. Please note that the MNN El Barrio Firehouse will be closed the Saturday before any holiday that falls on a Monday.